The dawn of the smartphone age had us cheering for GPS chips and easy, on-the-go navigation. No longer were we beholden to sites like MapQuest (which still exists as a mobile app, by the way) and printing out directions. Instead, we could open up our maps app, input a destination, and receive live, turn-by-turn directions. It was like having a pocket-sized Marco Polo, Christopher Columbus, or Ferdinand Magellan as your permanent wingman. It was surely also a death blow to paper maps — but it didn’t stop there. Once we could navigate with our smartphones, the question became: “which software does it better?” Obviously, Google Maps is the best-known map app — it’s basically synonymous with mobile navigation. In fact, Google Maps was originally the iPhone’s default, preinstalled navigation software, until Apple launched its own Apple Maps. An app called Waze emerged as a third-party alternative, developing quite a following before Google bought it. We at Android Authority decided it was time to settle this once and for all. We’ve analyzed of all three apps, identifying their weaknesses and breaking down their unique strengths. Welcome to the Navigation Wars: Waze vs Google Maps vs Apple Maps. Who will reign supreme? One might expect Google Maps to take the gold. It’s Google, after all. The company has put incomprehensible amounts of money and resources into mapping the world. Beyond simply mapping the streets, the search giant sent out a fleet of Street View cars — which, according to a report from a few years ago, have collectively driven an estimated seven million miles — to take 360-degree photos along 99 percent of all public roads in the U.S. Users get to actually preview their route from a first-person perspective. Google is continuously repeating and perfecting this process in countries all over the world. Google Maps can give you directions on your next Florida vacation, but also when you finally take that trip to Greece. More recently, Google started providing detailed 3D imaging in lots of highly-populated and tourist-heavy areas. So in addition to getting a first-person street view of your route, you can zoom out to see a computer-rendered model of the surrounding area for contextual information such as the shapes and sizes of buildings. Algorithms built into Google Maps can even account for things like traffic jams. Basically, the software monitors user location and movement to see how they move through certain areas and compares that to historical data, so Google Maps can put out a traffic alert when drivers start to slow down. It may sound simple, but making it all work requires some finesse. Google has invested into complex software that provides detailed 3D imaging in lots of highly-populated and tourist-heavy areas. When you open Google Apps, you get a very clean interface. At the top, you’re invited to either search for your destination — obviously employing Google’s popular search engine — or input an address. Whether you’ve selected a destination, the map shows you the destination on the map, as well as reviews (if it’s a business), the amount of time it would take you to travel there, an option to learn more about the destination, and a big blue button that says “DIRECTIONS,” which will begin plotting your route. It will typically give you the choice of a few routes, depending on how many different ways there are to get to your destination. Arguably the biggest selling feature of those standalone GPS units we used to buy for our vehicles was spoken turn-by-turn directions. Google Maps rolled out turn-by-turn directions a couple years back and currently offers three options: spoken directions for each step of your route, no spoken directions, or an alert mode, which means Google Apps will only speak to you about things like travel alerts and missed turns. Google Maps allows you to program multiple stops into a trip or conduct a search for an additional stop while still en route. In operation, Google Maps maintains its clean UI. Your location is denoted by an arrow points in the direction you’re facing. From what I can tell, the app uses the direction in which you were last moving to determine the direction to point the arrow since the arrow will change direction if you begin to reverse. On occasion, though, the app seems to get confused about which direction you’re facing. This tends to happen when you’re sitting still for a few minutes (like at a stoplight), or if you initiate a trip while you’re sitting still, at which time the app may think you’re diverting from the route and begin needlessly amending it. If I start a trip while sitting at a stoplight, for instance, the app can’t seem to remember the direction in which I had just been traveling and may tell me I need to turn around when I’m actually facing the right way. These hiccups are easy to deal with and won’t cause any catastrophes, but it’s worth making note of them. Some Google Maps features are particularly useful. You can program multiple stops into a trip or search for an additional stop while still en route. The options menu offers toggles for different map views, including satellite (replaces the standard map appearance with satellite images), terrain (overlays a topographical map over the existing roadmap), and traffic (adds color-coded traffic details to all roads instead of just the ones you’re traveling). Even something as simple as being able to choose different modes of travel — car, bus or public transit, walking, and biking — is a thoughtful addition that really expands your options with Google Maps. On top of directions, Google Maps contains tons of useful information about nearby businesses, restaurants, and points of interest, with plenty of filters to find what you're looking for. Due to the bevy of information Google Maps contains, it has a few added functions. One of my favorites is using it to find restaurants. When you open Google Maps, open the menu bar on the lefthand side and select “Explore.” This will open a directory of restaurants and other venues nearby. Along the top, you have a toggle with which you can filter the results by meal (options are Breakfast, Lunch, or Dinner), find a place where you can get your next caffeine fix (Coffee), or plan for your evening social hour (Drinks). Naturally, Google is always rolling out new features and improvements. It’s gained some pretty robust offline functionality, asking you for your permission to download a chunk of the map (your general vicinity) or to save trips to local storage so you can pull them up without a data connection. Essentially, it makes Google Maps useful even when you don’t have an internet connection. If you are using Google Maps with Android 8.0 Oreo or higher, you can use the picture-in-picture mode. You can see a small window that shows Google Maps working on the main app page. You can see the map, a turn indicator, which road you are currently traveling on, and an ETA for your destination. Google Maps recently added a way to search for reviews of stores, restaurants, hotels and other places from within the app. There’s also a new tab labeled “For You” which offers recommendations of places and businesses in your immediate area, especially brand new or “trending” ones, based on Google’s data. A number of voice commands also work with Google Maps to do things like mute or unmute the voice guidance, inquire about your next turn, avoid highways or tolls, and find a gas station. As someone who appreciates and uses both Android and iOS devices, I’m pretty familiar with both Apple and Google’s navigation apps. Aside from a handful of times over the past few years, though, I’d never really used Waze much. Before I started writing this article, I took a good 10 days or so to familiarize myself with Waze. Did you know that Google has owned Waze since 2013? If we’re splitting hairs, Waze is technically owned by Google’s parent company, Alphabet. It allegedly operates mostly independently from Google, but there has definitely been some crossing of the streams. The acquisition of Waze brought traffic alerts to Google Maps later that year. Waze has incorporated some of Google’s data too, including Street View. You wouldn’t know Waze was owned by Google by looking at it — it has a completely different aesthetic. Personally, Waze’s cartoonish appearance reminds me of emojis. Everything looks very bubbly, but Waze manages to maintain minimalist elements, which keeps it from being too much. But the differences between Google Maps and Waze are more than skin deep. When you open the app, you’re prompted to login or create an account, both of which are done by either connecting your Facebook account or using your mobile phone number. Once you make it to the main screen, the map includes a notification to let you know how many “Wazers” are in your proximity. Right off the bat, there’s an inherently social element to Waze throughout much of the user experience. Unlike other navigation apps, Waze suggests logging in to make the most of its social features. While Google Maps is sparse and almost utilitarian, Waze feels a little more dressed-up, with more bells and whistles. You can connect Waze to your Spotify accoun to manage your music directly from the Waze app by adding a bar along the top of the screen to select from your playlists and preferred stations. You can report traffic, car accidents, speed traps, road closures, and other such things to your fellow Wazers. This function plays a significant role in Waze’s ability to keep users abreast of their local traffic conditions. Waze almost goes overboard on extra features, ranging from Spotify integration, to petrol station prices, and a huge range of novelty turn-by-turn navigation voices. You can do things like manage your account details (set a profile picture, view your friends list, read your messages), as well as manage your favorite places and check your planned drives in the main menu. The planned drive feature is really interesting. In essence, you set a destination for a future date, so when the time comes you can start navigating there with just one or two clicks. It’s really easy, too; when you search for a destination, you can either click “Go” or “Later” to choose the date and time for your trip. Alternately, it can glean information from your Facebook calendar, scheduling trips to specific destinations based on the events you’re attending. If that’s not impressive enough, Waze adjusts how long the trip will take based on traffic at different times of day, so a 15 minute trip in the morning may take 30 minutes during rush hour. Waze is even courteous enough to remind you when it’s time to leave so that you’ll arrive on time. In addition to being able to either schedule or initiate a trip to that destination, Waze can guide you to the closest parking lot to your destination. I your destination happens to be a mall or retail outlet, it’ll give you the option to set your destination as the closest parking lot or allow you to choose from other parking options nearby. I didn’t really get to take advantage of this feature, but I can see it really being a godsend in an unfamiliar place. If you like customization options, Waze offers a bunch of different voices for turn-by-turn instructions. Many of the most populated countries get at least two options, but English-speakers have a plethora of options. Each voice is given its own name, like Jane, Nathan, or Boy Band for Americans, and Kate, Thomas, or Simon for those in the U.K. In the past, Waze even offered celebrity voices, including Morgan Freeman and more recently Liam Neeson. Waze relies on data collected and posted by its real-time users and has a much more inherently social feel than your standard map app. As you get deeper and deeper into Waze, you find all these nifty little surprises. In the settings menu, you can go into “Gas stations & prices” to choose your preferred gas station chain (if you happen to have one). You can also set the speedometer to only show up if you happen to go over the speed limit. With a toggle, you can control whether or not you see nearby Wazers on your friends list. There’s a whole host of map display options you can toggle, including speed cameras, other Wazers, road hazards, and more. A few months ago, Waze got a big update adding hands-free navigation, using just your voice. The feature, called simply Talk to Waze, can be turned on by heading into Settings > Sound & voice > Talk to Waze > Toggle Listen for “OK Waze.” Then just say “Ok Waze” to initiate a drive, get a preview of the route ahead, send reports, or add a pit stop without touching your phone. Other recently added features include adding routes optimized for motorcycles. There’s also a new HOV lane feature for carpooling drivers, or those with a special pass or in an electric, hybrid, or clean-fuel car. If you are driving such a car, and there are HOV lanes available on your route, Waze will show you additional navigation options and arrival times. Another recent update improved the ETA feature, allowing users to get an estimated traffic forecast for your route. Waze may sound bloated with needless features, but most of them are tucked out of the way and accessible only from the menus. None of Waze’s additional features feel imposing or like they’re coming between you and the purpose of the app, which is to get directions from one place to another. There are tons of bells and whistles available if you want to use them. As mentioned previously, there’s something inherently social about using Waze, an interesting but not totally surprising concept in 2018. Overall, my experience using Waze was extremely pleasant. Despite having so much going on, the app is very snappy and responsive, although I may not have used it long enough to encounter the hiccups that surely come up from time to time. Prior to iOS 6, Apple smartphones had Google Maps preinstalled as the default navigation app. In hindsight, Apple creating its own alternative to Google’s popular trip-mapping app was inevitable, if for no other reason than to boot the competition’s software off the iPhone. As usually happens with newborn software, Apple Maps was plagued with bugs and map inaccuracies for the first couple years. It’s gotten a lot better since then. I’m a lover of both Apple and Android, so I’m nearly as familiar with Apple Maps as Google Maps (although having access to the latter with any desktop browser basically ensures some disparity between the two). In certain ways, I may even like Apple Maps best of all. Compared to both Google Maps and Waze, Apple Maps has arguably the most pleasing look and has exemplary integrations with other iOS apps. After that rough first year, Apple invested lots of time and energy (and money) into improving Maps, and it shows. Compared to both Google Maps and Waze, Apple Maps has arguably the most pleasing look. Of course, appearance is subjective, but there’s something very polished and contemporary about Apple Maps, particularly since its slight redesign earlier this year. It manages to achieve a modern feel without looking sparse like Google Maps or borderline-cartoonish like Waze. It’s elegant, and very Apple. Perhaps taking a cue from Google Maps, Apple Maps has much better integrations with other iOS apps. Sprinkled throughout Apple Maps, you’ll find suggestions for scheduling and upcoming events for which you may need to travel. It’s reminiscent of how clicking addresses will take you into Google Maps from Gmail or Inbox or Google’s numerous other services. However, Apple Maps integrations extend even outside the Apple apps family, including things like OpenTable for making restaurant reservations, ride-sharing apps, and, of course, Apple Pay to pay for it all. Similar to Google’s app, Apple Maps has a very clean and straightforward interface. Opening Apple Maps brings up the map with an overlap toward the bottom, giving you a place to input an address or search for a destination. It also offers suggestions and the ability to click a single button to begin navigating home. If you were already home, it may offer you navigation to your workplace or a destination pertaining to an upcoming event in your calendar. It sounds like a lot, and while everything is big and readable, it’s also not totally in the way. One of the updates to Apple Maps brought something called “Flyover Mode,” a Google Earth-esque feature into the mix. In essence, it creates a 3D render of the map, allowing you to essentially fly over it like you’re in a helicopter. The feature itself isn’t especially groundbreaking, but it’s fun and certainly a welcome feature. Anything not already visible in the app is usually accessible with an upward or downward swipe, appearing neatly and organized on overlaying cards. You can swipe upward on an upcoming trip to view alternate route options. It’s a nice feature to have if, for instance, you happen to see that there’s traffic on your would-be route. And yes, the app can give you that traffic information, too. Apple has tried to make Maps as informative as possible and, in doing so, includes some really thoughtful details. If you click on a landmark, it usually brings up a card showing a picture, offering you directions, reviews (via Yelp, of course), and a link to Wikipedia to learn more about it. As well, if you zoom into a part of the map sufficiently far away from your actual location, it’ll show you that location’s local weather in the bottom-righthand corner. Apple Maps is focused on providing navigation. By comparison, Google is much more focused on places, which means that it’s able to provide both navigation as well as allowing you to simply use Google Maps like tourists would use paper maps as they explored their surroundings. When it comes to the actual map, though, there’s both good and bad news. The bad news is that Apple Maps just isn’t as robust as Google Maps (or Waze, for that matter, since it incorporates Google data). If you zoom into the same section of a large city on both Google and Apple Maps, Google’s map contains more accurate data, particularly when it comes to the names and locations of businesses. In fact, someone decided to track changes to both maps over a year and found that for any given section of the map, Apple Maps averaged fewer businesses than Google. However, as long as you search for and bring up the address of the business, Apple Maps can get you there — even if the business isn’t on the map. That brings us to another key difference between Google and Apple Maps. Clearly, Apple Maps is focused on providing navigation, and that’s a good thing since navigation is the point of these apps. 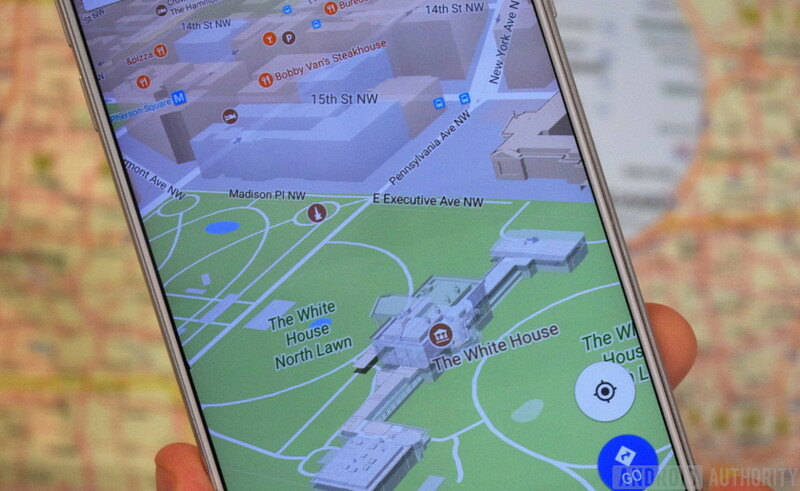 By comparison, Google is much more focused on places — it’s able to provide navigation while allowing you to simply use Google Maps like a tourist would a paper map as they explore their surroundings. Again, Google simply has more data with which to build a map containing. It’s almost an unfair comparison, but it’s a difference that’s worth mentioning. It seems that Apple Maps is mostly reliant on map information licensed from TomTom and from acquiring a handful of smaller companies over the years. Some of those companies are WifiSlam for interior maps, HopStop and Embark for public transportation, Locationary for improving mapping abilities, and BroadMap for managing and analyzing map data. This is all expected to change soon. Apple’s SVP Eddy Cue recently told TechCrunch the company is working a major revamp of the Maps app and service, and will use first-party data collected from iPhone owners. It will start slowly with the upcoming iOS 12, beginning with Apple’s Northern California area this fall. The plan is to phase out the use of third parties for map data entirely, but its not clear exactly how long that transition will take. TechCrunch also reports that, like Google Maps, Apple has been collecting street level map images and date via its own fleet of Apple Maps vans. Among other things, there is hardware and software inside the vans that allows them to map the world around that vehicle in full 3D. That date, combined with high-resolution images taken via orbiting satellites, should give future Apple Maps users full 3D navigation of streets, complete with high-res textures. Apple Maps has come a really long way since the early days, when Tim Cook actually apologized for how “difficult” the Google Maps replacement was. In fact, it’s become quite serviceable in its own right. Some of its biggest strengths include its very attractive design language, and very intuitive UI. But is that enough? So who wins in the Waze vs Google Maps vs Apple Maps war? That honor goes to Google Maps. Obviously, I don’t speak for everyone. A lot of people will be on Team Waze or Apple Maps. I chose Google Maps as the winner of the navigation wars because I feel like Google Maps is the navigation app that can meet the most users’ needs. Google’s put a lot of work into improving and fine-tuning Google Maps. I think we can safely say that no other navigation app has more than 20 petabytes of map data, obtained by having a fleet of cars physically drive more than 99 percent of all public American roads. Plus, Google Maps has the power of the Google search engine behind it. As I said before, that’s hard for anyone to compete with. No other navigation app has more than 20 petabytes of map data that was obtained by having a fleet of cars physically drive more than 99 percent of all public American roads. Google Maps is a great example of how the evolution and growth of technology can change our lives — it’s for far more than just navigation. In large part, Google Maps is a place-oriented navigation map, and it’s become a catalyst for exploration of new places. Rather than solely giving us driving directions, we can use Google Maps for learning and discovery, and that’s pretty damn cool. Waze and Apple Maps are not bad navigation apps. Waze definitely has more features to offer, some of which could actually be quite useful, though I doubt many would find them necessary or vital to their use of Waze. Just because an app has the most bells and whistles doesn’t mean it’s right for most people. If I were giving a “Most Improved” award, or perhaps a “Best Dressed” award, it would probably go to Apple Maps. Due to the improvements it’s made, many iOS users don’t feel the need to immediately download Google Maps or Waze from the App Store, and that certainly says something. At the same time, even considering how you can access Apple Maps via the desktop app for MacOS, it’s difficult to recommend it over Google Maps (or even Waze) for all but a very limited number of uses. However, as we stated earlier, Apple is working on even more improvements that should allow it to compete better with Google Maps and Waze. All but Apple Maps are available for both Android and iOS devices. At least for the time being, Apple Maps is only available for Apple devices. Now I’d like to hear from you. Which map app do you use? Why do you use it? Sound off in the comments below!